X-ray laminography is a powerful technique for quality control of semiconductor components. Despite the advantages of nondestructive 3D imaging over 2D techniques based on sectioning, the acquisition time is still a major obstacle for practical use of the technique. In this paper, we consider the application of Discrete Tomography to laminography data, which can potentially reduce the scanning time while still maintaining a high reconstruction quality. By incorporating prior knowledge in the reconstruction algorithm about the materials present in the scanned object, far more accurate reconstructions can be obtained from the same measured data compared to classical reconstruction methods. We present a series of simulation experiments that illustrate the potential of the approach. Batenburg, K.J, Palenstijn, W.J, & Sijbers, J. (2014). 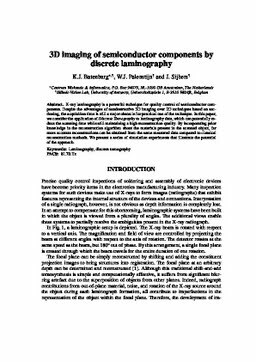 3D imaging of semiconductor components by discrete laminography. In AIP Conference Procroceedings 1601.